There is an epic collision about to happen and you’re all invited. This epic collision will happen right in our own galactic backyard, just about 30 million years from now. 30 million years may seems a lot but on astronomical scale it’s not. According to Hubble Space Telescope researchers, a giant space cloud, travelling at a rate of 1.1 million km/h (700,000 mph), is currently set on a collision course with the Milky Way Galaxy. Smith’s Cloud is an enormous cloud of gas comprising mostly of hydrogen and heavier sulfur. This cloud measures up to 11,000 lightyears in length and about 2,500 lightyears in width (9.5 trillion km is equal to a lightyear). This massive cloud was discovered in 1963 by Dutch radio astronomer Gail Smith, current research that the massive space cloud was made some 70 million years ago. Due to high ratio of sulfur gas, astronomers suggests that Smith’s Cloud possibly initiated from the Milky Way. But no one knows how and why it was ejected out of our galaxy. And now, it returns with a massive bang. One important thing about this: this collision will not kill us — at least not anyone from Earth — because this take place thousands of lightyears from us, at the very edge of the Milky Way Galaxy. Nothing on Earth will get hurt but instead, we will get to witness a glorious light show including the birth of nearly 2 million stars. The cloud is an example of how the galaxy is changing with time. 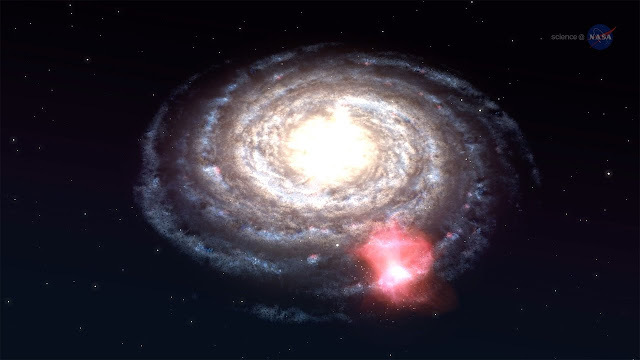 It’s telling us that the Milky Way is a bubbling, very active place where gas can be thrown out of one part of the disk and then return back down into another. 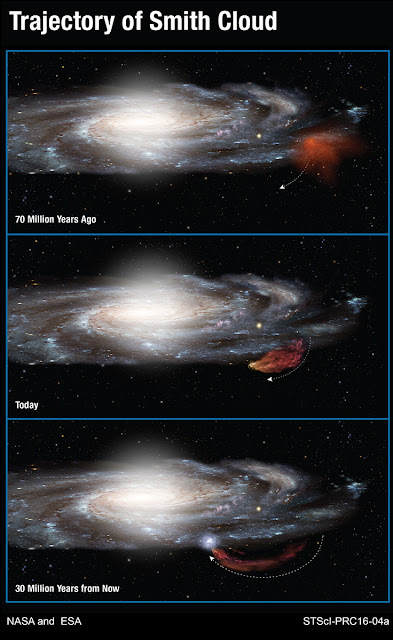 Our galaxy is recycling its gas through clouds, the Smith Cloud being one example, and will form stars in different places than before. Hubble’s measurements of the Smith Cloud are helping us to visualize how active the disks of galaxies are.